Members of the European Parliament take a vote in Strasbourg, France, Sept.12, 2018. 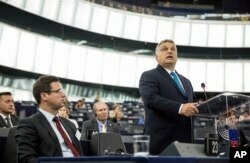 European Union legislators took the unprecedented step Wednesday to begin process of imposing sanctions on Hungary for presenting a "systematic threat" to the bloc's Democratic values. The vote dealt a serious blow to Prime Minister Viktor Orban, further isolating him from powerful allies in the midst of his ambitious effort to push Europe toward Hungary's version of an "illiberal democracy." Hungarian Foreign Minister Peter Szijjarto condemned the vote as "nothing less than the petty revenge of pro-immigration politicians." He also said Hungary was considering legal actions because the vote was tainted by "massive fraud" since abstentions were not included in the final count. "Viktor Orban's government has been leading the charge against European values by silencing independent media, replacing critical judges, and putting academia on a leash," she said. "The Hungarian people deserve better. They deserve freedom of speech, non-discrimination, tolerance, justice and equality, all of which are enshrined in the European treaties."